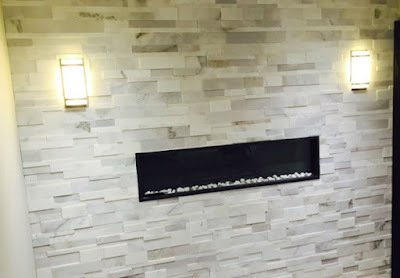 Toronto Custom Concepts just wrapped up this recent renovation that was highlight by this off white and light grey stone accent wall. The random pattern of the stones also provides the wall with nice texture since each stone protrudes out to a different distance from the back wall. The accent wall is highlighted by a sleek linear fireplace located in the centre of the wall. To provide addition counter-balanced symmetry to the wall, we have also installed these contemporary wall sconces to provide additional accent lighting... Let us know if you like our design!